Now that Bruce Jenner has admitted that he is transgender to Diane Sawyer, viewers will also get to see how his family took the news in an upcoming E! special, Keeping Up With the Kardashians: About Bruce. But in a clip that premiered on NBC's Today show, it looks like ex-wife Kris Jenner struggled to handle his admission. 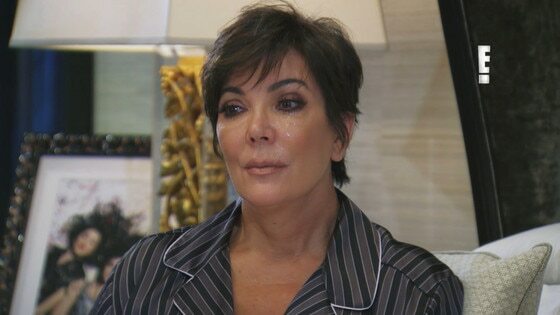 The footage shows Kris, who is crying, talking to daughter Kim Kardashian about the Olympian's transition. "I have these memories of this life, and I feel sometimes like it didn't exist," she says while shedding tears. But Kim tries to explain to her mom that it isn't like that. "He has to deal with this for his entire life of waking up and feeling like 'whoa, this isn't my body. This doesn't feel comfortable,'" she tells her mom. "You really have to like let go." Bruce told the world, "For all intents and purposes, I am a woman," last month and also said that Kim was the "most accepting" of the news, which is probably why she can be seen here helping her mom try to be OK. During the 20/20 special, Bruce recalled how Kanye West helped his wife get over the surprise. "He says to Kim, 'Look, I can be married to the most beautiful woman in the world, and I am. I can have the most beautiful daughter in the world, and I have that. But I'm nothing if I can't be me. If I can't be true to myself, it doesn't mean anything.'" The two-part special will also include footage of the family that will remind viewers and his family of the special times they shared with Bruce as a father, husband and friend. Part One premieres Sunday, May 17, at 9:00 p.m.
Part Two follows Monday, May 18, at 9:00 p.m. In addition to this special, E! will also air an eight-episode documentary series chronicling Bruce's new life as a transgender woman. The first episode of the untitled series will debut July 26 at 9 p.m.
Watch new episodes Keeping Up With the Kardashians Sundays at 9 p.m. on E!